I would eat chocolate covered bacon in a millisecond! Sure because the salt in the bacon and the sweet taste of chocolate compliment each other. I understand that at our California State Fair we have deep fried bacon. Now that is the one I really want to try. I remember when Pronto Pups were first introduced at the Minnesota State Fair. I was a teen-ager, I think. I know my mother and I both loved them. I'm gonna pass on that one. But a friend of mine made bacon flavored ice cream - that I would try! 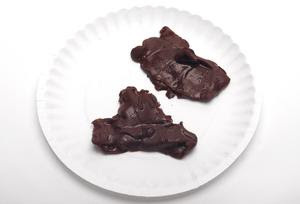 I am totally going to the Illinois State Fair one day JUST to eat chocolate covered bacon. That is the perfect marriage of my two favorite foods. All I can say is ewww. I dont like chocolate anything. It is on AlterNet and if you can't find it I have the URL for it so drop me an email. John, it is funny that you found this at your fair. I can actually imagine eating veggie bacon covered in chocolate, although I can imagine eating most food covered in chocolate. It seems that all fairs have some kind of odd food combo to try/sell.